As you accumulate guitar pedals, your mind will naturally turn to a pedal board enclosure to house all your compact effects units. A solid pedal board makes your side of the stage tidier and neater, protects your pedals, and prevents accidents from occurring (i.e. accidentally kicking one of your pedals out of the signal chain). As with most guitar products, pedal boards come in a variety of shapes and sizes. Some are rugged, others are powered. Some are easier to use, and others offer greater access to each of your pedals. The right unit depends on your rig, which means there’s no one-size-fits-all solution. But here are six pedal boards that might just be what you’re looking for. What Should I Look For In A Pedal Board? Can I Build My Own Pedal Board? Can I Get Someone Else To Build My Custom Pedal Board? Can I Mix And Match Different Brands Of Pedals, Pedal Boards, And Power Supplies? 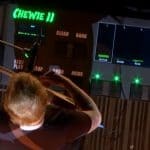 Where Can I Get A Pedal Board Like Ed Sheeran’s Chewie 2? The GPB-BAK-1 is good bang for the buck. It comes in three different sizes, with the large one being just over $147. The “large” size is in fact the medium size in this case, but still features plenty of room for your pedals, for about a dozen, give or take. 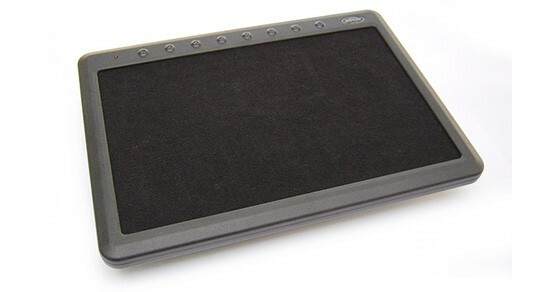 It is made with lightweight aluminum, has a mounting bracket for power supplies under the board, is angled toward the player, and includes adhesive Velcro strips as well as a carry bag. Those with very specific needs may want to find another pedal board. But for most, Gator Cases will do the trick. The PB600 unit comes with a built-in 9V DC power supply and patch cables. 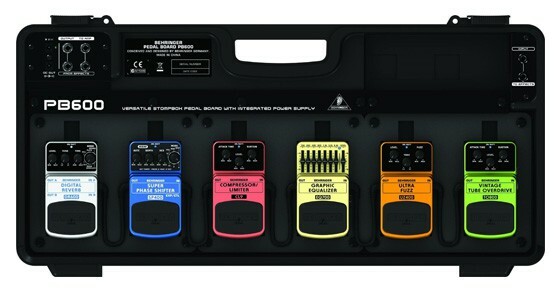 Compact and lightweight, you can use up to six effects pedals with the Behringer board. The construction is rugged, and should hold up to repeated beatings. Best of all, it only costs about $100. For simple setups, this board will do the trick. 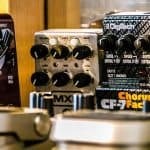 If your pedals are an unusual size, have different power requirements, or if you have more than six effects pedals you want to use simultaneously, you should look for alternatives. It may not look like much, but the Classic PRO is heavy duty stuff. It’s a hand-crafted pedal board made with aircraft-grade aluminum, and it comes with a professional-grade tour case to boot. It accommodates plenty of pedals, and comes with adhesive and zip ties to secure your pedals. But the board itself will run you nearly $300. 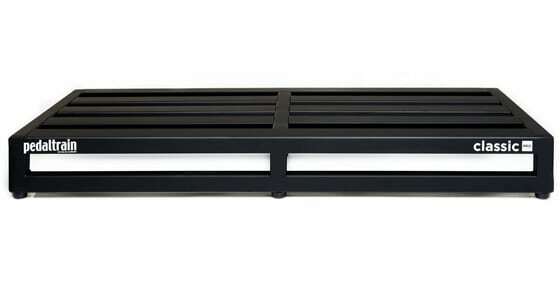 If you know you need tour-worthy equipment, then the Pedaltrain is an option worth looking at. The BCB-60 is a classic. It comes with an AC adaptor, is lightweight, durable, and padded on the inside. 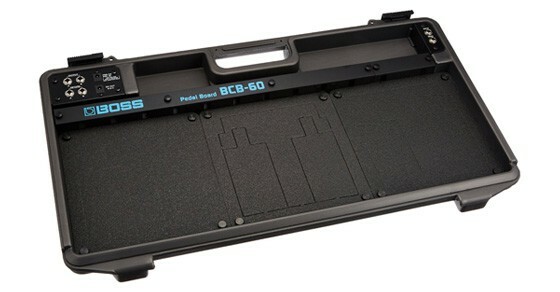 You can power up to seven devices using the BCB-60, and it includes all the cabling you need. 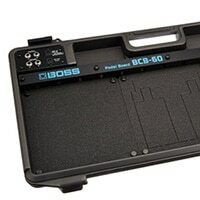 Essentially a direct competitor to the Behringer PB600, the BCB-60 offers just a little more at the reasonable price of $169. It can also house pedals that aren’t the standard size. If you’re a pro, then the Boss is not the be-all end-all pedal board, but for casual and even semi-professional use, it’s got everything conveniently in one place. 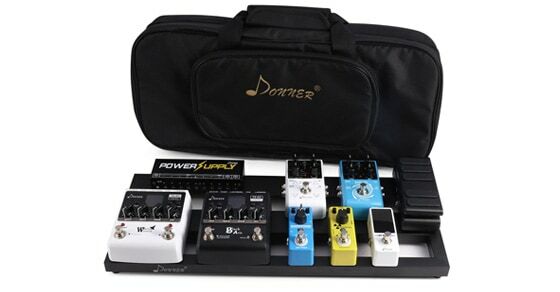 Donner is somewhat of a newcomer to the low-cost compact pedal niche, but their products aren’t half bad. Take the DB-2, for instance. 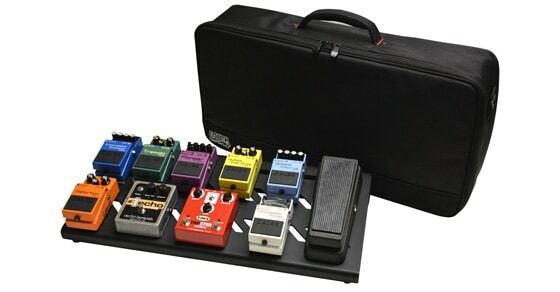 For only $58, you get a carry bag, adhesive backed hook-and-loop and zip ties (as with the Pedaltrain unit), and a decent amount of surface area for your effects pedals. You get what you pay for, but the Donner is a reasonable starter kit overall. Again, this powered pedalboard may not look like much, but it comfortably fits up to eight pedals, includes 9V DC power, a gig bag, and only costs about $80. Customer reviews are somewhat mixed, but you can’t ask for too much at that price. For beginners requiring a little more flexibility, the SKB unit is one you could pit against the Boss and Behringer pedal boards from earlier. No one knows your needs better than you do. You know how many pedals you have, what their power requirements are, and whether you’re planning to swap out pedals or add new ones in the future. But here are some things to think about if you’re looking to buy a pedal board. Naturally, you don’t want your pedal board to fall apart at the least opportune moment. Most units are rugged and made to last. But sometimes the case or the cables it comes with aren’t the best quality. This isn’t too tragic, since cables usually aren’t hard to replace. Ultimately, the level of durability required depends on how much performing and touring you’re planning to do, but either way you should find a pedal board that isn’t going to break on you if someone happens to sneeze in its general direction. You have two options here – you can either buy a pedal board that has built-in power supply, or you can find a pedal board that has sufficient room for a power brick. Built-in power supplies generally don’t handle specialty pedals with specific power needs. If you’re just using Boss, Donner, or Behringer pedals, no worries. But if you’ve bought pedals overseas, own an extensive collection, or if you have some rare units, then 9V DC probably isn’t going to cut it. Built-in power is a good way to go if you’re looking to cut costs, but not great if you need more flexibility. Keep this in mind when you’re buying a pedal board – you may need to mount or add a power supply to the unit, potentially leaving less room for other effects pedals. Some pedal boards with built-in power supplies may kill your tone somewhat, or may not offer the cleanest signal. You can usually check customer reviews on Amazon or elsewhere to see what other people have had to say about the product. Some degradation of tone is expected, but if it’s bad, it’s not worth keeping. Also, bear in mind that some pedals are just tone-suckers, and they may be to blame rather than the pedal board. Some pedal boards can hold more pedals than others. But if they’re packed in so tight together that you have a hard time tapping each of them individually without your foot accidentally stomping on others, that’s not going to do you much good. The point is to have good separation between each. Some pedal boards are elevated, and others are angled for better accessibility. Find the right fit for your foot size and other needs. Some pedal boards are easier to use than others. Keep in mind that you must wire up all your pedals. If the included cables are too short, or only barely reach, it’s going to be a tight fit, and setup could be frustrating. Or, you may mind that specific power supply units or pedals aren’t well-matched to the pedal board you’re looking to buy. Units with built-in power supplies are often the easiest to use, but there are other things to be aware of if you go this route (also see earlier sections on Power Supply and Sound Quality). How easy is it for you to swap out or add pedals after your initial setup? 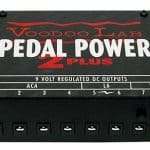 If your pedal board has a power supply, does it accommodate pedals with different power needs? If you have any intention of changing things up down the line, you don’t want to be too limited in what you can do with the pedal board you purchase. Try to take a long term perspective of what you’re planning to do. Yes, and many guitarists do end up going in this direction as they settle on the pedals they plan to use over the long haul. Even without extensive experience in building pedal boards, it’s relatively easy to put together a homebrew unit that will do the trick. You can literally find a block of wood (you can even use an old skateboard), cut it to the size you require, paint it black, attach Velcro to it, and you’ll be off to the races. One thing you should keep in mind is that your custom-made pedal board may not be as durable as a commercially available reinforced road kit. This is fine if you’re touring with roadies that care for your gear and follow procedures every single time they set up for you. Quite another thing if you’re on the road with the guys, and they literally throw the gear in the van after a show. Another aspect, of course, is accessibility. And by that, I mean the ability to stomp the right pedal at the right time. People with smaller feet don’t need as much room as people with bigger feet. And some people find it easier to see all their pedals if their pedal board is lit, or if their pedal board is slightly elevated. This is where customization can go a long way, because you can set it up however you want to. Yes, you can. My friend Patrick Zelinski had parts of his custom-made because he uses an insane number of pedals. This makes for a very heavy board. It seems like accessibility would be a nightmare, but he had a separate footswitch installed towards the front of it so the pedals are easy to bypass (he doesn’t have to stomp on the pedals individually). He just has to remember what switch is connected to what pedal (they are numbered). There are many people that build pedal boards, and you may even be able to find a builder in your hometown. Again, since you can get it built to your exact specifications, getting your needs met is easier than buying a commercially available unit. Yes, regardless of whether you use a pedal board or not, you still need to be thinking about signal chain to get the best results possible. As a basic rule of thumb, your pedals should go in this order: tuner, wah, compression, overdrive, EQ, pitch, modulation, volume or level, echo, and then reverb. Depending on your preferences you might reorder your effects chain slightly, but this is a good starting point. If you don’t have any pedals that belong to certain effects categories (like modulation effects), just move onto the next one. The short answer is yes, and in some cases, you’re going to have to, because a company like Pedaltrain doesn’t even make compact pedals or power bricks. Beginner guitarists often purchase all Boss, Behringer, or Donner pedals. At the very least, this makes your power needs predictable. 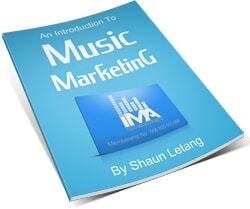 But intermediate and pros often mix and match. They might have a Vox Wah, an Ibanez Tube Screamer, a MXR Carbon Copy Analog Delay, a TC Electronic Corona Chorus, and a DigiTech Whammy for instance. Not surprising that power needs would vary when looking at this many different brands and models. So, someone with that selection of pedals would match up a power supply brick that met all their needs. And since wah pedals generally take up more space than other compact pedals, they would also buy a pedal board that had some flexibility (i.e. not the Behringer PB600). And more than likely, they wouldn’t buy a pedal board with a built-in power supply, unless it was a premium board. Some “premium” boards can’t even be found on Amazon, including products built by Furman or Brady Cases. This is a tricky one, but we give the full answer on Ed Sheeran’s Chewie 2 here. I hope you find it useful. Tastes change over time. Unless you would call your rig the “ultimate setup,” you’re probably going to change up your equipment down the line. You might as well remain somewhat flexible in your approach. Can’t afford a fancy pedal board now? No problem. Why not pick up the Boss or Behringer unit and keep things simple? You can use between six (Behringer) and seven (Boss) pedals with these units, and that tends to be plenty for beginners. If all you’re looking to do is have some fun, then these will more than suffice.